Wow! Cheri’s Scrapbook Paper Balls are absolutely wonderful! Our different styles and how our imaginations work make this Christmas Ornament Countdown an excellent showcase for each of our talents. I make the mesh first and start that with a collar of beads big enough to fit around the neck of the glass ball. Then I make the first long strand about 1/2″ longer than the diameter of the ball and then start the mesh. I add the draping beads last, working at a diagonal along the mesh, which also helps to reinforce your thread. Some glue on the knots and you are good to go. It does take me about 2 days to complete one. I learned how to make these from that wonderful magazine Bead & Button. 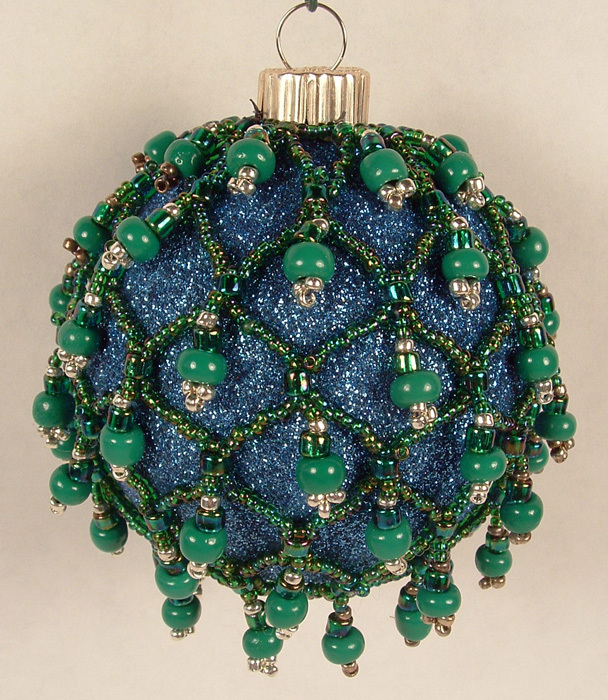 Every December issue they have an article about making beaded ornaments with a very informative how to. The ball is just a purchased one, I did not paint it, although I have done so in the past. 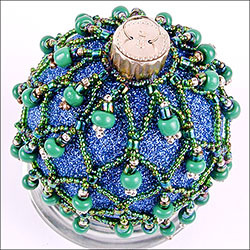 I just liked the color of this ball and thought that it set off the AB beads (aurora borealis) quite well.